The traditional Breadth Thrust Signal occurs over 10 days when the sum of daily advances outnumbers the sum daily declines by roughly a two to one margin. You can get some insight into thrust potential prior to the ten day period if the thrust is strong enough. Over the last three days, my 3 Day ADT number is 78.2 (subject to minor revision). ADT = ADV/(ADV+DEC). 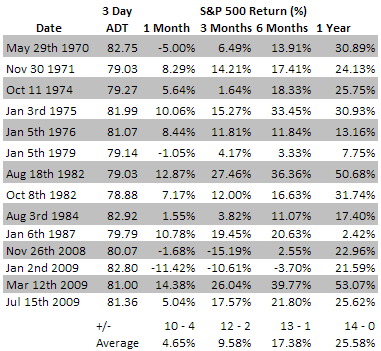 There have been 14 instances since 1970, where the 3 day ADT has exceeded 78.0. 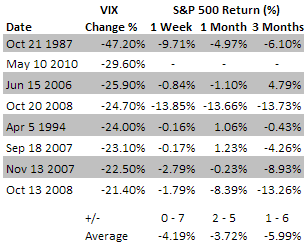 The S&P 500 is a perfect 14-0 one year later with a gaudy 25.58% average return. It would be convenient for the bulls to get confirmation from the 5, 10 and 20 day thrust signals over the next week, but this is a heck of a start. Great Stuff Wayne, Martin Zweig would be impressed-outlook remains bullish medium term, good for long term equity investors. I replicate the same studies on VXO (the old Vix) using the -20% threshold, then optimized in time frame range from 21 to 180TD (holding period). The best fit is sell (yes, SELL) the Vix (so, the future) after it lose more than or equal to -20% in one day and buy it back 67TD later. 100% hit ratio (9-0). The problem is … a huge adverse excursion So, probably the S&P500 goes down (have to check your data) … but the Vix doesn’t go up after 3 Months (67TD). I will scan my database to find the best portfolio, in that time frame, of world indexes (ETF) that better perform (outperform) is such cases. More on the subject tomorrow. I’ll have some more today. There are a couple of things I want to study this morning. 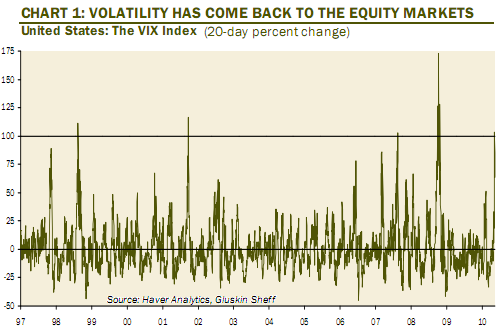 One of the problems with the VIX contraction numbers is that they came two days after an incredible one day VIX expansion. I’m a bit more likely to lean toward the thrurst numbers. But trying to resolve. Hope to have some new input in a couple of hours. 3) recover all of the losses within one week without a retest of lows. But take a good look at October 27, 1997. The market was 14 days off it’s yearly high and had a 6.89% selloff. staging an afternoon rally and then never looked back. The difference there and now, is that in 97, the sp at least opened lower the day after capitulation selloff. A bit perplexing, but everyday that passes, positive momentum is building and the train is leaving. Great stuff. Keep it up. The only question I have is with you expecting a pullback before marching higher. How many trading days should we see pass in your estimation before a resumption of the uptrend. Is there not enough sample data. 2006 sticks out like a sore thumb and 3 months seems like a fairly long time. What software do you use for your analysis? Look at mid January of 98 in the NASDAQ. Wasn’t that the retest ? Is there some unwritten rule that a retest has to happen immediately ? I ran my scan for days that had 5% intraday selloffs. Then scanned further for ones that occurs near tops. Then visually examined the handful. The 06 case could very well be similar, but did not have a 5% intraday selloff. I am struggling with whether a retest is in the cards or not. Normally, if a capitulation bottom occurs at the bottom of an extended move downward, there is a 90% probability of a retest. But given that this appears to be a quick sharp correction in a bull mkt, I can’t say with as much confidence. Very few data points to relate too. In the Oct 97 case above, which was associated with the Asian Currency Crisis, the bottom was put in at 876.73 on the capitulation day. The only pullbacks were to 903.68 on day 3 and to 905.96 on day 12, then we never looked back. Both of those pullbacks were sharp quick one day events with no follow through. And the tremendous momentum that I wrote about yday, may prevent a full pullback. maybe 20 points down is all we get, and then you run the risk of where does that 20 points start from. If I were an investor, I would be working into long exposure. If you are a trader, you have the quandry of what kind of pullback do you want to play for. I write my own computer software, old school, FORTRAN. As I type we are up 5.1%. Since 1950, there have been 22 weeks where Mon-Thursday was up 5.0%. Fridays are 14-8 in this spot. The one percent moves were 6-2. In the short-term, he notes the big rebound on Monday saw the S&P gap up more than 4% at the open. That’s something that has only happened six other times in recent history, Harrison says, citing the work of Jason Goepfert at Sentimentrader.com. “In every single [prior] case, the ‘gap’ was eventually filled, and usually very quickly,” he continues. I scanned for four % opening gaps. Three from late Oct 87 and three in the Fall of 2008. I didn’t get much help from those, do you? While it’s too early to know exactly, it looks like we will be maximum overbought by Monday week (the 24th). Of course this depends to some extent on what happens between now and then. Right now, it looks like we’re getting oversold again with the oversold indicators at a higher level creating a bullish divergence. Gap appears likely to be filled, rapid Dow recovery did not feel right after such a long advance..shaping up to be a difficult summer.